3 Bedroom/2.5 Bath, Sleeps 7. Quiet Neighborhood setting with peek a boo water views. Feel like a Maharaja in this bright and airy, 3-level jewel of a home, with 3 bedrooms and 2 1/2 bathrooms. Wonderful floor plan: the great room has many windows and a pleasing flow connects to a formal dining room and a kitchen with a breakfast bar. While you cook, step out on the large upstairs deck and enjoy a glass of wine and view the ocean in the distance. Kitchen has a small office space attached for guests needing to catch up on work emails. The master suite has customized built-ins and a spacious master bath with both stall shower and Jacuzzi-bathtub. Downstairs, you will find a second bedroom with a Queen bed and a third bedroom with a double and single bed. The 3rd bath is also on this level through the laundry room. Skylights and a glass enclosure overlooking the entry hall add to the many custom features of this home. The living room has a propane fireplace, Cable TV and comfy couches for lounging. A two-car garage is also available for your use. This exceptional house boasts nice landscaping and large backyard with a sitting area under the deck overhang. Located in a quiet residential neighborhood in a desirable part of town. 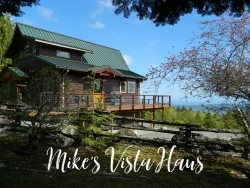 Perfectly situated in the heart of Port Angeles with easy access to Hurricane Ridge, Lake Crescent, Sol Duc Hot Springs and the areas many beaches. Wonderful shopping and local restaurants just minutes away. Great family vacation home, with spectacular water view and comfortable furnishings. I was here with family members for a 4-night stay in early July. The three-bedroom home is large and well laid-out for groups of up to six. The large living room is a comfortable place to gather or watch television, and the kitchen is large and well-equipped with all the basics. There is a sweet, well-tended yard, and a second-floor terrace with a peek-a-boo water view. We were delighted on the second morning to watch a tiny, speckled Bambi wander through the back yard like she owned the place. ***Please note that the nightly rates on this property are based on 4 guests; An additional guest nightly fee will be added per person up to 7 guests max.